What is Tony DeAngelo’s future with the Rangers? Tony DeAngelo represents one half of one of the more lopsided trades against the Rangers in recent years. As part of the Derek Stepan deal, DeAngelo was going to be counted upon to usher in the new era of Rangers defensemen. 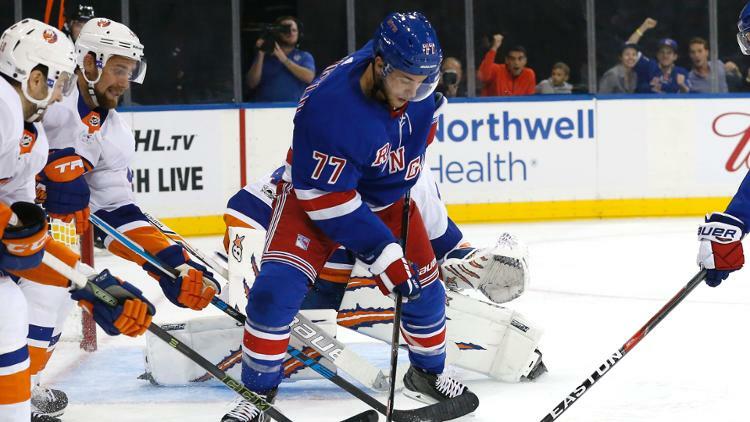 He didn’t stick with Alain Vigneault, but with a new coach and a strong preseason, this was to be DeAngelo’s chance to prove himself at the NHL level. Through eight games this season, DeAngelo has dressed for just two games, and one was him dressing as a forward. He has a pair of assists in those games, which is his job. However despite the points, DeAngelo has yet to stick in the lineup. David Quinn’s job is to develop youngsters. However that doesn’t always mean playing time. Quinn called out DeAngelo, stating he needs to give a more consistent effort and be better in order to earn his role. There are obviously pieces of information we are not privy to, but that quote is pretty damning. DeAngelo’s on-ice attitude has been something that has plagued his reputation. Tampa Bay drafted him and cut bait pretty quickly. Arizona appeared to be more than eager to dump him as well. Now on his third team –all before his 22nd birthday– time is running out for the young defenseman. We don’t know if this is the case, but to be called out by Quinn leads us to believe that it is indeed his attitude and consistency (effort) is the biggest concern. The skill, at least offensively, is there. However Neal Pionk appears to have beaten him out for that last RD spot. Adam McQuaid is getting more time than DeAngelo. It appears that if not for his injury, Frederik Claesson was ahead of DeAngelo as well. That makes DeAngelo the 8D on a team that is trying to develop youth. Regardless of how you view playing time in a rebuild, the fact that a coach who specializes in developing players isn’t playing DeAngelo is a giant red flag. DeAngelo’s Rangers future is a question mark at the moment. It was a question mark at the start of the season, but is even bigger now that he isn’t getting regular playing time. Even if his future isn’t on the blue line, and a transition to winger is in the future, it won’t matter if he can’t put together 60 minutes of consistent effort. Or at least something that shows Quinn he is ready to contribute regularly. Or maybe this is all just part of Quinn’s development plan. Tough love can work as long as there is accountability. Quinn is the supposed development specialist, but time is certainly running out for DeAngelo in New York. "What is Tony DeAngelo's future with the Rangers? ", 4 out of 5 based on 8 ratings. “Lopsided Trade” – if you feel that Stepan was a poor player with an albatross of a contract, and we received a top 10 pick, yes lopsided in our favor. AD was a throw in. Tony D must not be putting enough effort into practice, otherwise he would see more NHL time. Probably a combo of work ethic and attitude holding him back. Waivers stopping his move to the AHL. Some players take longer to figure out what the coach needs. In Tony’s case, time might certainly be running out. Our window was shut when Gorton made that trade. Stepan is a fantastic two-way center with a great contract. You do not trade good players in their prime for spare parts. Especially when it’s clear the Rangers had not done their homework on ADA. Spare parts? You mean like the 7th pick in the draft? TBH I think it was Raanta for ADA, Stepan for the 7th pick — and it was Raanta that was the spare part rather easily replaced by a younger and better Georgiev. This is the guy we traded for a first round pick in a weak draft. Heck of a job Gortie! Regarding Stepan’s excellent lockout season—Stepan never approached that PPG average again in any other season in his career. He is a guy who gets 52-57 points a year ordinarily. And the trade was beneficial to the Rangers because it didn’t allow a no movement clause to kick in and hamstring the team down the middle. Zibanejad has replaced Stepan effectively across the board except in terms of durability. Step’s loss hasn’t been a huge one, and I say this as someone who was a big fan of Stepan when he was a Ranger. Would you trade away any of those guys you listed for Stepan? I was always a fan of his, but he is nowhere near the player those other 15 names are. Maybe I’d trade O’Reilly for Stepan, but that’s a strong maybe. Stepan was on a real good trajectory early in his career, which is why the Rangers paid him. Clearly they envisioned Stepan developing into a 60-80 point 2-way center. Sadly, his production plateaued really young. It’s possible he is going to age very poorly as he’s already one of the slowest skating forwards in the league. Turned out Derek was a guy with a relatively high floor and a low ceiling. He never developed, he arrived in the NHL pretty much fully formed. Paying $6M with a no-trade clause to an aging 55 point center that is already painfully slow is not a good idea. The Rangers found a sucker to take Stepan off their hands and nabbed the #7 pick in the process. As for Raanta, goalies are the definition of spare parts in trade talks. No one pays for goalies except bad GMs, like Mike Milbury. Let’s not get carried away on the Stepan love. I liked him a lot as a Ranger and felt his consistency was undervalued by many fans. But to call him a fantastic player is an exaggeration. Stepan is a bottom 5 #1 center in this league, arguably a great 2nd line center who’s played out of place for the last 3-4 years. His contract had a no movement clause that was due to kick in, so Gorton smartly moved Stepan. As far as the trade is concerned, I think that Andersson is showing some scoring touch in the AHL and might become a similar player to Step. Yes, Bobby: though I hate to admit it, given his age, discernible skills, et al, DeAngelo might be on the verge. Claesson’s acquisition and ascent foreshadowed DeAngelo’s slide down Coach Q’s depth chart. Inasmuch, it’s not like we haven’t been here before. Bobby Sanguinetti’s 30 now; scored a bombshell wife. Playing in Europe… not a bad gig. Auditioning for a spot on the US Olympic squad. One player’s vertical arc is another’s horizontal. Thanks for the update Dave. I have been wondering what was going on. I don’t believe, but do not know for sure obviously, that Tony’s had an attitude problem before where he dogs it. The attitude problems on the ice in the past were him losing his cool during the game and doing dumb things like shoving a ref. However, maybe there are other things. He has the skill, but does he have the brains to be a good hockey player? I guess Quinn will sideline him until he sees DeAngelo working hard enough and improving. Hopefully he gets it and pushes McQuaid out of the lineup. I don’t care what ADA’s political views are (hey, Tim Thomas won a SC) and I don’t even care that a young 20 year old lost his cool on or off the ice in the past (hey, Evander Kane got past it). I can only go by what I’ve seen and what I’ve seen leads me to believe there’s a good hockey player underneath all the “supposed” issues and he merits a legitimate shot to play consistently — and to make the occasional mistake, just like other young players on this team. Thing is, I’m not even sure why he was scratched in the first place — unless it has to do with dogging it in practice — because his play in the 2 games was pretty good (certainly better than some of our vets). That said I defer to Quinn – for now – but I won’t speculate that a talented player like ADA is a bust or that his play so far (or lack thereof) somehow makes the Stepan trade “lopsided”. I am with you Tanto. I’d like to see a 22 year-old guy like ADA make it and play instead of a fading hockey player like McQuaid. I don’t know if Tony will or not, but I am rooting for him to get it right and earn a spot. First of all, this has nothing to do with politics. If you don’t want someone with his views on the team, you do not trade for him. Once the deal was made, the Rangers were all in on maximizing their asset. I should also point out that people here know next to nothing. Quinn obviously does not trust ADA. That means that when he did play, he was used in situations that were not considered dangerous. And he looked fine – so what, anyone looks fine playing against players who aren’t threats. So he is rightly being judged on stuff we are seeing none of. That does not mean the judgment is right, but it does mean we have no basis for second guessing. Does ADA have talent? Absolutely. Is he talented? I don’t know. He may have chronic unfixable weaknesses. As for attitude, it is not just about playing hard. When the coach says, “You keep doing such and such wrong and need to adjust”, the coach can tell if he is trying to adjust or arrogantly continuing to play the way he always has. And the coach can see if he is having success. Finally, the Rangers do not need a player who contributes what he contributes at this time. He is good on the power play, but so are Shattenkirk and Pionk and two such defensemen are all the Rangers need. OTOH, the Rangers are afraid to use him on the PK. As they also don’t use Shatty, that puts them in a bind. If one of the other four defensemen takes a penalty, the Rangers have to kill it off with only three D Quinn trusts. Personally I think the Rangers are trying to trade him at this time. If they can get a third rounder, they just might take it. If they can only get a 7th, they’ll figure out that he would actually clear waivers and send him to Hartford. If what they can get is somewhere in between, they have a problem. Funny how things work out. Chris Bigras, who started last season in the NHL with Colorado, did clear waivers and now has 7 points in 8 games at Hartford with a +6 IIRC. I am guessing he is paired with Hajek, since Hajek has about the same +/-. Does anyone on the Ranger’s staff actually watch Staal play defense? Do they FF through the video of him repeatedly coughing up the puck and passing to no one? ADA could play on his knees and he would be an upgrade over Staal. Look at this point we can clearly see this trade was a huge bust. (Personally I would fire Gorton over it) Obviously hindsight is 20/20 so I am not hating on anyone. We essentially got nothing for stepan and raanta. Nothing. 2 years removed from the trade and ADA is not playing and riding the bench for whatever reason and there is rumors all around. And the 7th pick was a flop. I am not saying lias is a bust but he is at best a dominic moore. Great shutdown 4th line player or 3rd line center on a bad team. But this kid still couldn’t make our team so what does that say? As another point of reference Howden is shining out there on a nightly basis. So the trade at the time was for a 1C and your backup goalie. Whether or not Stepan in your view was a 1C …is not important. He was and still is a 1C on our team and the team after us. You want to bicker over point production…our present 1C has not surpassed 55 points yet or even come close. But our old 1C never hung out on the blue line waiting for stretch passes, or folded over in pain when his head got rocked. Or buckled his leg from not knowing how to skate. He missed one game in the playoffs after prust broke his jaw and he had to eat soup for a month. He took a slapshot right to his femur and even then he finished out practice. So cut the crap. He was a hell of a player and still is. Since his departure the Rangers have never been the same. Can’t say that about a whole load of players that have come and gone since. But as soon as Stepan and giradi left the team, we welcomed the tank and we tanked hard. So this discussion is really about whether or not Management willing traded stepan for the reason of the no movement clause? Which certainly is a strong possibility. Paying high on ADA and the 7th was worth the risk at the time if your true reason for moving him was Sather and that horrible contract he offered him. Gorton could see this would be a problem in the future and as soon as he was in charge said I will trade him and take the gamble. But if that really was the case how come he didn’t move staal at that time 2 years ago? I mean at that time staal probably still had some real trade worth. Step’s trade followed by Staal’s trade I would certainly buy that Gorton didn’t want those NMC’s on his team. And as GM he had every right to do so. But he didn’t and I can remember vaguely some of you calling for staal’s head that year after the ottawa series. We are all shooting darts at a board in the dark with this present ADA situation. Staal has fully given up and isn’t even trying anymore. I think the last three games have been his absolute worst. McQuaid looks like giardi did after all those playoff runs and a fractured knee cap. So Quinn should be playing ADA just for the fact that we can’t get worse. But, he isn’t which means there is alot more behind the scenes we can’t see as arm chair gm’s and coaches. The kid has the tools to be great. I am so tired of this argument that the Stepan trade was or isn’t as bad as it seemed when it first happened. It was by far and away the worst trade I can remember. Nothing in my mind comes close. Personally I was not a fan of cally getting traded but that after a year panned out perfectly except for the additional 1st round picks we gave tampa. But since 2000 can you remember a worse trade? sorry meant this to be a rangers worst trade debate. Not league wide. There is a youtube video uploaded of a recent Q/A with ssn tix members. gorton doubled down on his looking for character thing. then a question from the crowd came in “where do u see the elite scorer coming from” ? he sort of was on the defensive but mentioned chytil and kravtsov. I guess they internally dont view lias in that realm. Just shows how poorly executed that trade was. Am I the only one who thinks a different set of eyes and cerebral hemispheres should be driving this rebuild? You really like overpaying for production. Hagelin, since he left NY, has gobbled up $16M in cap space for a mere 229 NHL games and 94 points. Fast, since Hagelin has left NY, has used up $6M in cap space and in 227 NHL games has 89 points. Why was giving Hagelin away a bad deal? Where does anyone write that dumping Hagelin was a bad idea? I personally didn’t like it and we got absolutely nothing for him and basically he was the driving force for the penguins 2 stanley cups. But hey if you only look at point production then yeah it was a smart move money wise. But for anyone who has watched the rise and fall of this franchise….big money free agents don’t win you cups. But Hagelin was a character guy. A guy who did what was needed with speed. And I doubt fast is as quick as hagelin was. you are not. I personally think Sather and Gorton should have seen their day come a long time ago. The present state of this team is years of bad decisions and horrible draft selections. If Dolan even slightly cared he could see they need to be fired. But this franchise will always make money so who cares. just want to give credit to the poster for arriving at his conclusions based on hockey related issues without deviating into outside arena matters simply because one disagrees with certain opinions or beliefs. I would like to speak to the person or persons whose decision was to acquire DeAngelo. He is not getting a lot of ice time and his alleged off ice behavior is not a good fit for the Rangers organization. Rebuilding is hard enough to do. Either trade him or let him go. That will never happen while those 2 are in charge ….they cannot just commit to the fact he is a lost cause and eat it. Just like they are selling the public on how great Andersson will be. It takes a big man to admit when he is wrong and let me tell you ….in my eyes there are no big men in the front office. ADA was a throw in, in the trade. The trade was the first indication that the future was being prioritized over the current. The Rangers were looking to get rid of Stepan before his NMC kicked in. While a very good player he had just “spit the bit” in the playoff run, scoring almost nothing, and the Rangers didn’t want to be locked into their top center who clearly wasn’t a 1C. Raanta has proven to be outstanding but the Rangers could only keep him for one more year. The Rangers wanted the 7th pick, which is very valuable but the 3 players they wanted there were all taken so they settled for Lias who was not rated to go top ten. ADA was just a flyer throw-in, a talent who was not tracking well. And so that has continued with this third try. Obviously there is something going on with his approach to practice, habits, etc, that everyone who sees him wants to get rid of him. Quite certain it has nothing to do with his politics, etc, who cares about that, certainly not Quinn. Comments about how good he is and that he should be playing are not credible unless they address his problem, which we really don’t know what it is. But it is something significant. As mentioned Quinn would like nothing more than to play his young talent; pretty obvious, at least to me, from his approach so far. He has fallen in love with Howden and now has Pionk as first D on PP ahead of Shattenkirk. I totally disagree with the notion that ADA was a throw in on that trade. It is like saying the rangers offered Zibenjad and Georgiev for the 7th overall pick in this past draft. Does that even remotely seem realistic? They got raped and that is that. If things fell out differently yeah it could have turned out better. But this trade is a fireable offense with any GM. With the one exception. Any other franchise would have fired their GM. As far as your move Stepan before his NMC kicked in…why didn’t they do the same thing with Staal at that exact moment? Did you not see what I wrote? That whole motivation for moving Stepan is mute with the fact that they kept staal. At that time he certainly had a significant trade value. And he alone could have got us a late first round pick cause essentially that is what Nash got us and then some to then flop on the bruins and retire. Staal has a full no movement clause as part of his contract and had it since Day 1.